Objective: To evaluate the effects of Oscimum sanctum L (O. sanctum), an important medicinal herb, on alcohol withdrawal syndrome in Wistar rats. Methods: Liquid diet with 7.2%, v/v ethanol was administered to the rats for 21 d. Control group animals received sucrose as an isocaloric liquid diet. After alcohol withdrawal, rats were examined at 6th and 24th hour for major withdrawal signs that included anxiety and hyper locomotor activity. Ethanol withdrawal anxiety was tested using elevated plus maze, light and dark model; the hyper locomotor activity using actophotometer. O. sanctum leaf extract (100, 200 and 300 mg/kg, oral) and diazepam (2 mg/kg, i.p) were administered to the treatment group animals 30 min before alcohol withdrawal estimation. Drug treatment was also given 30 min before the second observation at 24th hour. On the last day of the protocol, rats were sacrificed by cervical dislocation liver, kidney and brain were isolated and preserved in formalin for further histopathological examination. Results: Findings from the present study revealed that O. Sanctum leaf extract treatment at doses 100, 200 and 300 mg/kg, oral had a significant protective effect on signs and symptoms of ethanol withdrawal in alcohol-dependent rats. However, no remarkable pathological and microscopic alterations were observed in histopathological examination. Conclusions:O. sanctum seems to be an active drug for the treatment of alcohol abstinence syndrome. Alcohol abuse and dependence impose worldwide major public health and is the most important public health problem. Alcohol dependence is a long-term, relapsing brain disorder which results due to excessive ethanol intake. Abruption in the chronic alcohol intake leads to the ethanol withdrawal syndrome, which is mainly characterized by anxiety and various other signs and symptoms such as agitation, elevated blood pressure, pulse, nausea or vomiting, hallucinations, insomnia, delirium, sweating, tachycardia, tremors, convulsions and hypertension. Symptoms may lead to severe forms marked by seizures, cardiac arrest and death occur in 5% to 10% of patients. Withdrawal symptoms generally begin after 6-24 h of the last ethanol consumption,. One of the factors in human alcoholics which lead them to heavy drinking is the use of alcohol to get relieved of the withdrawal symptoms or to re-experience the same level of the rewarding effects previously experienced with ethanol. Negative emotional responses coming from ethanol withdrawal symptoms are the reported reasons that lead to relapse to alcohol use and anxiety is the most important negative motivation among them. Among the various limbic structures, the amygdala and hypothalamus activation are believed to have an important role in modulating ethanol withdrawal anxiety-like behaviors. Ethanol consumption leads to neurobiological and behavioral alterations which are mediated by N-methyl-D-aspartic acid (NMDA) excitatory and γ -aminobutyric acid (GABA)A inhibitory receptor systems. Ethanol dependence results in a decreased GABAA neuroreceptor response and up-regulation in excitatory NMDA receptors, this modulate ethanol drinking reinforcement reward, drug discrimination, tolerance, dependence, and withdrawal. GABAergic and NMDA/glutamatergic systems can be the important drug targets in achieving a long-term abstinence from alcohol,. In present treatments for the ethanol withdrawal syndrome are very few such as benzodiazepines, acamprosate, naltrexone and disulfiram, but these medications can only debilitate ethanol craving and have no effect on withdrawal symptoms. Among all benzodiazepines is the only drug for treatment of alcohol abstinence syndrome, but are associated with side effects that mimic the symptoms of alcohol withdrawal includes anxiety, emotional stress, trembling, sweating, headache, sleep disturbances, irritability, nausea, weight loss and myalgia. New drug choices and an effective drug treatment for the ethanol withdrawal syndrome are necessary. Plants are the important sources of medicine and about a large number of drugs (25%–30%) in use are derived from plants,,. Among plants of high therapeutic value, the plants of the genus Oscimum family Lamiaceae are very important due to their diverse medicinal properties. Oscimum sanctum (O. sanctum) (Tulsi) has been used traditionally for thousands of years for its varying healing properties and has been well documented for its medicinal properties,. Chemical compounds isolated from various parts of the plant include eugenol, cubenol, rosmarinic acid, β -sitosterol, apigenin, luteolin, borneol, cardinene, linolenic acid, gallic acid, palmitic acid, oleic acid, stearic acid, carnosic acid, vallinin, vitexin, vicenin, rientin, vallinin acid, circineol, vitamin C, vitamin A, iron and phosphorous. Animal studies showed that chronic use of O. sanctum in large doses may cause infertility in both male and females. These anti-fertility effects are though reversible, and may not cause permanent damage. The major constituent which is reported for the anti-fertility effects is ursolic acid,. Another component estragol present in the O. sanctum leaf extract may cause uterine contractions. A study reported that O. sanctum leaves may lower blood sugar level. Apart from the few side effects O. sanctum is also reported to possess analgesic, anti-inflammatory, antidiabetic, antistress, immunomodulatory, antipyretic, antiasthmatic, anticancer, hepatoprotective, anticonvulsant, antihyperlipidemic, neuroprotective and memory enhancer activities. Moreover, in-vitro research documented the affinity of O. sanctum extract for GABAA, GABAB, benzodiazepine, adenosine, inositol triphosphate and 5-Hydroxytryptamine receptors. Hence, the present investigation was designed to explore the protective properties of the O. sanctum against the ethanol withdrawal syndrome in rats. Plant material (Dried leaves) of the O. sanctum (Bath number: RHD 283), has been procured from Natural Remedies, Bangalore. Dried leaves were then coarsely powdered with a mechanical grinder and passed from sieve number 60. Coarsely powdered plant material was stored in an airtight container and further defatted with petroleum ether (30–40 °C). The air-dried defatted plant material was further extracted using soxhlet apparatus (ethanol 70% v/v, temperature 50 °C for 48 h). The hydroalcoholic solvent was recovered by evaporation using a rotary evaporator (Heidolph, Germany). The semisolid mass has been further lyophilized (New Brunswick) at -40 °C for 24 h. The obtained dry powder of the plant was stored at 2-8 °C till further use. The phytochemical screening tests of the hydroalcoholic extract of O. sanctum were performed for the detection of phytoconstituents like alkaloids (Wagner's test), flavonoids (Shinoda's test), glycosides (Legal's test), fixed oils (Oil Stain test), phenolics (With 5% Ferric chloride solution), sugars (Molisch's test), tannins (With 10% Lead acetate solution), saponin (Foam Test), steroids (Salkowski reaction) and terpenoids (Salkowaski Test)[20-22]. Wistar rats (220-250 g) were purchased from the National Institute of Pharmaceutical Education and Research, Mohali, Punjab, India and housed (two animals per cage) at Animal House, Jaypee University, Solan, H.P. They were acclimatized to laboratory conditions maintained at temperature (23±2) °C, controlled humidity conditions, and light and dark cycles (12:12 h). Animals were fed with food pellets diet (Aashirwad Industries, Chandigarh, India) and water ad libitum. Experimental procedures were carried out after the approval from the Institutional Animal Ethics Committee (3/ GLG/2014/JUIT/IAEC) and as per CPCSEA (Committee for the Purpose of Control And Supervision of Experiments on Animals) norms (1716/PO/a/13/CPCSEA). Animals were divided into 6 groups (normal group, disease group, 3 treatment groups, and standard control group) each comprising 6 animals (n=6) and housed individually. Alcohol treatment was given with a liquid diet as specified in earlier studies,. Liquid diet ad libitum with or without alcohol was given to the rats; no other chow or water was given. Liquid diet was prepared as per previous studies which contain cow milk 925 mL, alcohol 25–75 mL (ethyl alcohol 96.5%), sucrose 17 g and vitamin A 5 000 IU. Liquid diet (no alcohol) was administered to the animals at the beginning of the study for 7 d then 2.4% ethanol was given with the liquid diet for 3 d. The concentration of ethanol was then increased to 4.8% for the next 4 d then 7.2% for 21 d. Alcohol was withdrawn from the liquid diet after 21 d. Drug treatment O. sanctum leaf extract (100, 200 and 300 mg/kg, oral), saline, diazepam (2 mg/kg, i.p) were given to the animals 30 min before alcohol withdrawal assessment. For evaluating alcohol withdrawal signs like anxiety and hyper locomotor activity were tested at 6th and 24th hour of the withdrawal period using elevated plus maze, light and dark model and actophotometer. Between evaluation period the animals were returned to their native cages. Each group received another dose of the test drug at 24 h after the first. Control group rats received a sucrose-containing liquid diet (a caloric substitute to alcohol) and were also evaluated parallel to disease control groups. All observations were performed during the light period. Fresh liquid diet was presented at the same time (09:00 h) daily. 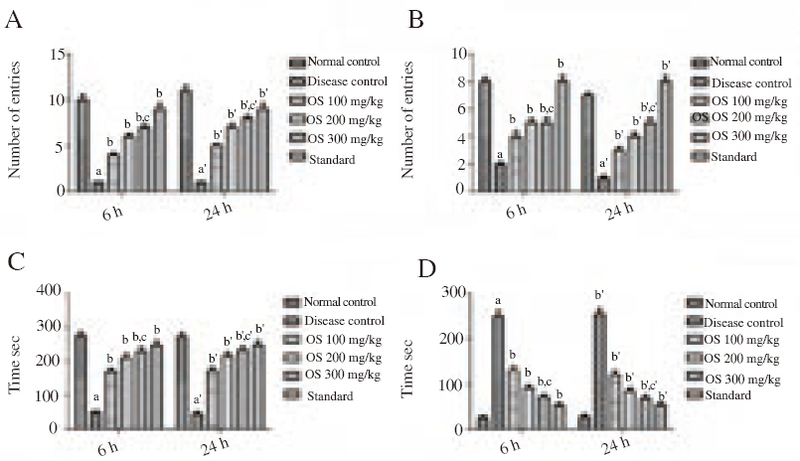 Body weight and ethanol intake by the rats were observed daily and expressed as g/kg/day. On completion of the protocol animals were sacrificed by cervical dislocation and liver, kidney, brain were isolated and preserved in formalin for further histopathological studies,,. The device consist of two open and two closed arms arranged opposite to one another and a central platform elevated at 50 cm. Animals were placed individually on the central platform facing towards the open arm. The number of entries in the open arms, total time spent and the number of entries in the closed arms and total time spent were recorded by the observer for 5 min. The observations were carried out under red dim light,. The model consists of two compartments one light and one dark in a rectangular box connected by an opening of 7.5 cmx 7.5 cm in between the wall. Animals were placed individually in the center of the light chamber facing towards the opening of the dark chamber. The number of entries among the light and dark chamber and the time spent in the light and dark chamber was recorded by the observer for 5 min. The spontaneous locomotor behavior of the animals was recorded individually for 5 min using a digital actophotometer. The count of the movement of the animal cutting a beam of light which falls on the photocell was recorded digitally. Rats were sacrificed by cervical dislocation and brain, liver and kidney were isolated. Isolated organs were fixed in neutral buffered formalin (10%). The 5 pm histological sections of the tissues were stained with hematoxylin and eosin method and were examined further under a microscope for determination of change or cellular damage. The body weight variations of alcohol control rats in comparison to normal group animals were analyzed by Student's t-test. Two-way ANOVA (analysis of variance) followed by Bonferroni's test was carried out for determination of the O. sanctum effects in the elevated plus maze, light and dark model and locomotor activities. The significance level was set at P< 0.001 levels. Phytochemical detection tests of the O. sanctum leaf extract revealed the presence of chemical constituents like alkaloids, phenolics, flavonoids, glycosides, fixed oils, sugars, tannins, saponin, steroids, and terpenoids. Day to day alcohol consumption in ethanol-fed rats vary between (13.28±0.89) to (16.41±0.64) g/kg and there was no significant difference among the groups. The body weight was (225.71±4.56) g and (231.30±5.49) g at the beginning of the study in control and ethanol fed group, respectively; (262.34±5.06) g and (242.14±6.01) g at the end of the study in control and ethanol fed group, respectively. A gain of 4.6% body weight in ethanol control and 16.2% in control group rats were observed over the initial body weight at the end of the study. 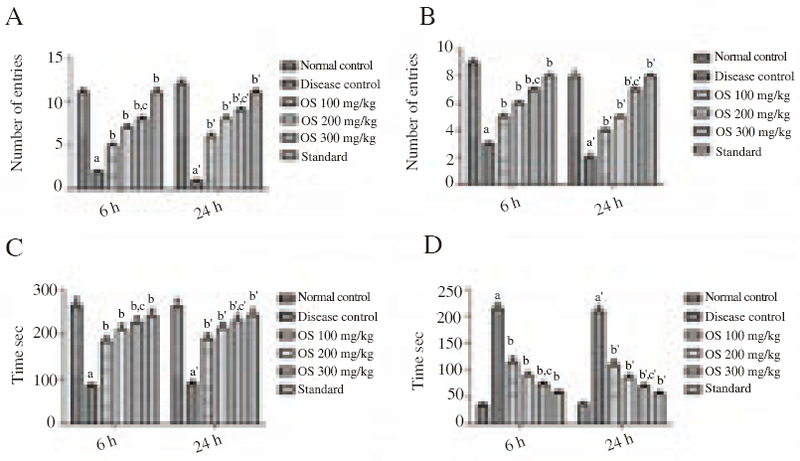 In comparison to the normal control group, ethanol-fed rats showed a significant decrease into the time spend in open arms, and in the number of entries into the open arms and closed arm; while it showed a significant increase in the time spend into the closed arms on the 6th and 24th hour of the withdrawal period [Figure 1]a, [Figure 1]b, [Figure 1]c, [Figure 1]d. Treatment with O. sanctum leaf extract (100, 200 and 300 mg/kg, oral) at 6th and 24th hour of alcohol withdrawal produced a significant increase into the time spend in open arms, and in the number of entries into the open arms and closed arm; while it showed significant decrease in the time spend into the closed arms as compared to the disease control rats [Figure 1]. Figure 1: Effect of drug treatment on alcohol withdrawal anxiety when tested on elevated plus maze model. A: No. of entries in open arm; B: No. of entries in closed arm; C: Time spends in the open arm; D: Time spends in closed arm. Results were presented as mean±SD analyzed by two-way ANOVA followed by Bonferroni's multiple comparison test. a: P<0.001 vs. NC, b: P<0.001 vs.DC, c: P<0.001 vs. diazepam after 6th hour. a’: P<0.001 vs. NC, b’: P<0.001 vs. DC, c’: P<0.001 vs. diazepam after 24th hour. 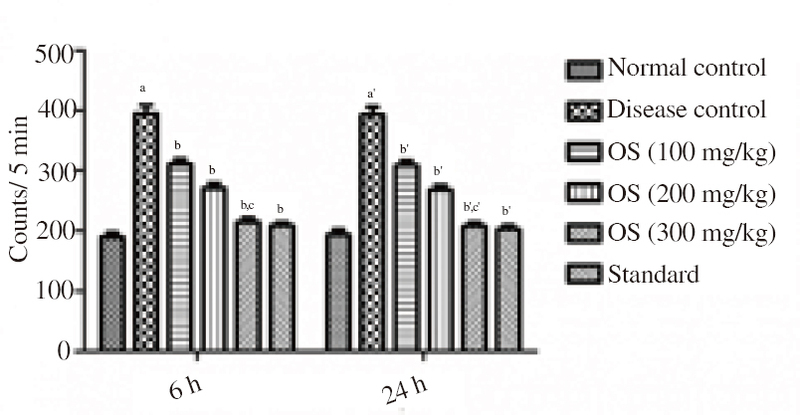 Ethanol-fed rats in comparison to the normal control group showed a significant decrease in the time spend into open arms, and in the number of entries into the open arms and closed arm; while it showed a significant increase in the time spend into the dark chamber at the 6th and 24th hour of the alcohol withdrawal [Figure 2]a, [Figure 2]b, [Figure 2]c, [Figure 2]d. Treatment with O. sanctum leaf extract (100, 200 and 300 mg/kg, oral) at 6th and 24th hour of alcohol withdrawal produced the significant increase in the time spend into open arms, and in the number of entries into the open arms and closed arm; while it showed a significant decrease in the time spend into the dark chamber when compared to the disease control rats [Figure 2]. Figure 2: Effect of drug treatment on alcohol withdrawal anxiety when tested on light and dark model. Results were presented as mean±SD analyzed by two-way ANOVA followed by Bonferroni's multiple comparison test. a: P<0.001 vs. NC, b: P<0.001 vs.DC, c: P<0.001 vs. diazepam after 6th hour. a': P<0.001 vs. NC, b': P<0.001 vs. DC, c': P<0.001 vs. diazepam after 24th hour. Ethanol-fed rats showed a significant hyper locomotor activity in the 6th and 24th hour of the alcohol withdrawal when compared with the normal group animals [Figure 3]. O. sanctum leaf extract (100, 200 and 300 mg/kg, oral) produced significant suppressive effects on locomotor hyperactivity at 6th and 24th hour of alcohol withdrawal [Figure 3]. Figure 3: Effect of drug treatment on locomotor hyperactivity when tested on actophotometer. Alcohol consumption and withdrawal did not produce any treatment-related pathological alterations in the alcohol-treated animals. Histopathological examination of the brain revealed the presence of normal glial cells [Figure 4] the liver showed normal hepatocytes with central and portal veins [Figure 4] and kidney displayed normal nephrons without any vacuolar degeneration of tubular cells, glomerular congestion and interstitial bleeding [Figure 4]. 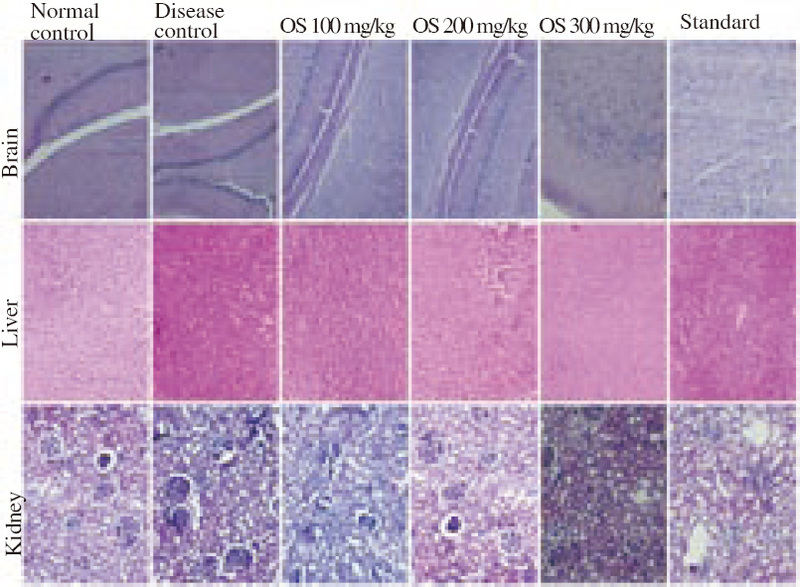 No histological changes were seen in brain, kidney, and liver of the alcohol-treated animals. Figure 4: Histology of brain, liver, and kidney (H&E, X100). The findings from our study revealed the inhibitory effects of the O. sanctum leaf extract on ethanol withdrawal symptoms in alcohol-dependent rats. Ethanol administration with liquid diet is a relevant and well-established model for ethanol consumption in rats,. Previous studies reported that daily consumption of ethanol over 9 g/kg for 15 continuous days leads to dependence and abstinence leads to various signs and symptoms in rats. In this study, we observed major signs of alcohol withdrawal such as withdrawal anxiety and hyper locomotor activity. The incidence of alcohol withdrawal anxiety observed in the alcohol-fed rats at 6th hour and 24th hour of abstinence were very similar to the previous studies,,. The present study demonstrates the significant effect of the O. sanctum in reducing anxiety at 100, 200 and 300 mg/kg which is similar to some of the previous findings,. The earlier studies reported the anti-anxiety effects of the O. sanctum in normal rats while our study revealed the anti-anxiety effects of O. sanctum in alcohol abstinence animals for the first time. O. sanctum at 100, 200 and 300 mg/kg showed a significant anti-anxiety effect in ethanol-withdrawn rats. Diazepam (2 mg/kg, i.p) was used as a standard drug. A significant hyperlocomotor activity was seen in the alcohol-dependent rats at the 6th and 24th hour of the alcohol abstinence when compared to the normal group rats. The hyperlocomotor activity of the alcohol withdrawal rats is similar to some of the earlier findings,. O. sanctum at 100, 200 and 300 mg/kg significantly normalized the locomotor hyperactivity in the actophotometer test. Body weight gain (6.2% approx.) was noted in control group rats, and body weights of the ethanol consuming rats changes lightly during the study as there was a 4.6% increase in body weight. This change in the body weight of the animals agrees with earlier findings as alcohol decreases the secretion of digestive enzymes and affects absorption, metabolism, and excretion of essential nutrients,,. Brain, kidney, and liver are the main organs which are affected by the alcohol, however, alcohol dependence and withdrawal did not have any pathological changes in the treated animals which were confirmed through histopathological examination. NMDA receptors and the glutamatergic system are believed to have a critical role in the progress of the alcohol withdrawal signs. The phytochemical study revealed that the hydroalcoholic leaf extract of O. sanctum contained constituents such as flavonoids, tannins, steroids, terpenoids, and glycosides. The literature reported that ¡3 -sitosterol, gallic acid, vallinin and luteolin have well documented anti-anxiety properties,,,. Hence, such phytoconstituents may have a protective role in the ethanol abstinence syndrome and these constituents may ameliorate the ethanol deprivation effects as O. sanctum is proved to have inhibitory effects on the reuptake of neurotransmitters such as noradrenaline, serotonin, dopamine and modifies neuronal excitability via GABAergic and glutamatergic and mechanisms. In conclusion, O. sanctum leaf extract seems to be pharmacologically active by suppressing ethanol withdrawal signs and symptoms and may have therapeutic potential in treating ethanol dependence. Jesse S, Brathen G, Ferrara M, Keindl M, Ben - Menachem E, Tanasescu R, et al. Alcohol withdrawal syndrome: mechanisms, manifestations, and management. Acta Neurol Scand 2017; 135(1): 4-16. Gonzaga NA, Mecawi AS, Rodrigues JA, Martinis BSD, Padovan CM, Tirapelli CR. Ethanol withdrawal increases oxidative stress and reduces nitric oxide bioavailability in the vasculature of rats. Alcohol 2015; 49: 4756. Salottolo K, McGuire E, Mains CW, van Doorn EC, Bar-Or D. Occurrence, predictors, and prognosis of alcohol withdrawal syndrome and delirium tremens following traumatic injury. Crit Care Med 2017; 45(5): 867-874. Roberts AJ, Heyser CJ, Cole M, Griffin P, Koob GF. Excessive ethanol drinking following a history of dependence: Animal model of allostasis. Neuropsychopharmacology 2000; 22(6): 582-594. Schunck RVA, Macedo IC, Laste G, de Souza A, Valle MTC, Salomón JLO, et al. Standardized Passiflora incarnata L. extract reverts the analgesia induced by alcohol withdrawal in rats. Phytother Res 2017; 31(8): 1199-1208. Kumar J, Hapidin H, Bee YTG, Ismail Z. The effects of acute ethanol administration on ethanol withdrawal-induced anxiety-like syndrome in rats: A biochemical study. Alcohol 2016; 50: 9-17. Besheer J, Lepoutre V, Hodge CW. Preclinical evaluation of riluzole: Assessments of ethanol self administration and ethanol withdrawal symptoms. Alcohol Clin Exp Res 2009; 33(8): 1460-1468. Long D, Long B, Koyfman A. The emergency medicine management of severe alcohol withdrawal. Am J Emerg Med 2017; 35(7): 1005-1011. Sachdeva A, Choudhary M, Chandra M. Alcohol withdrawal syndrome: Benzodiazepines and beyond. J Clin Diagn Res 2015; 9(9): 1-7. Sharma L, Sharma A, Gupta GL. Standardization of a polyherbal Preparation (POL-6) for treatment of oxidative, inflammatory and immune disorders. Int J Pharm Pharm Sci 2016; 8(4): 129-134. Sharma A, Sharma L, Goyal R. A review on himalayan pine species: Ethnopharmacological, phytochemical and pharmacological aspects. Pharmacogn J 2018; 10(4): 611-619. Majouli K, Hamdi A, Hlila MB. Phytochemical analysis and biological activities of Hertia cheirifolia L. roots extracts. Asian Pac J Trop Med 2017; 10(12): 1134-1139. Cohen MM. Tulsi - Ocimum sanctum: A herb for all reasons. J Ayurveda Integr Med 2014; 5(4): 251-259. Meghwani H, Prabhakar P, Mohammed SA, Dua P, Seth S, Hote MP, et al. Beneficial effect of Ocimum sanctum (Linn) against monocrotaline-induced pulmonary hypertension in rats. Medicines 2018; 5(2): 34. Kasinathan S, Ramakrishnan S, Basu SL. Antifertility effect of Ocimum sanctum L. Indian J Exp Biol 1972; 10(1): 23-25. Reghunandan R., Sood S, Reghunandan V, Arora BB, Gopinathan K, Mahajan KK. Effects of feeding Ocimum sanctum (Tulsi) leaves on fertility in rabbits. Biomed Res 1997; 8(2): 187-191. Setty AR., Sigal LH. Herbal medications commonly used in the practice of rheumatology: Mechanisms of action, efficacy, and side effects. Semin Arthritis Rheum 2005; 34(6): 773-784. Pattanayak P, Behera P, Das D, Panda SK. Ocimum sanctum Linn. A reservoir plant for therapeutic applications: An overview. Pharmacogn Rev 2010; 4(7): 95-105. Baliga MS, Jimmy R, Thilakchand KR, Sunitha V, Bhat NR, Saldanha E, et al. Ocimum sanctum L. (Holy Basil or Tulsi) and its phytochemicals in the prevention and treatment of cancer. Nutr Cancer 2013; 65(1): 2635. Sharma A, Goyal R, Sharma L. Potential biological efficacy of Pinus plant species against oxidative, inflammatory and microbial disorders. BMC Complement Altern Med 2016; 16: 35. Sharma L, Sharma A. In vitro antioxidant, anti-inflammatory, and antimicrobial activity of the hydro-alcoholic extract of roots of Withania somnifera. J Chem Pharm Res 2014; 6(7): 178-182. Tewari I, Sharma L, Gupta GL. Synergistic antioxidant activity of three medicinal plants Hypericum perforatum, Bacopa monnieri, and Camellia sinensis. Indo Am J Pharm Res 2014; 4(5): 2563-2668. Uzbay IT, Kayaalp SO. A modified liquid diet of chronic ethanol administration: Validation by ethanol withdrawal syndrome in rats. Pharmacol Res 1995; 31: 37-42. Uzbay IT, Saglam E, Kayir H, Celik T, Beyazyurek M. Effects of fluoxetine on ethanol withdrawal syndrome in rats. J Psychiatr Res 2004; 38: 445-450. Unsalan N, Saglam E, Kayir H, Uzbay T. Effects of olanzapine on ethanol withdrawal syndrome in rats. Eur J Pharmacol 2008; 579(1-3): 208-214. Bruzda EG, Grabska MM, Witkowska E, Izdebski J, Kotlinska JH. Enkephalin analog, cyclo[Ne , Nß-carbonyl-D-Lys2, Dap5] enkephalinamide (cUENK6), inhibits the ethanol withdrawal-induced anxiety-like behavior in rats. Alcohol 2015; 49: 229-236. Kumar J, Hapidin H, Bee YTG, Ismail Z. Effects of the mGluR5 antagonist MPEP on ethanol withdrawal induced anxiety-like syndrome in rats. Behav Brain Funct 2013; 9: 43. Kang S, Li J, Zuo W, Fu R, Gregor D, Krnjevic K, et al. Ethanol withdrawal drives anxiety-related behaviors by reducing M-type potassium channel activity in the lateral habenula. Neuropsychopharmacology 2017; 42(9): 1813-1824. Gupta GL, Rana AC. Effect of Withania somnifera Dunal in ethanol induced anxiolysis and withdrawal anxiety in rats. Indian J Exp Biol 2008; 46(6): 470-475. Lepicard, EM, Joubert C, Hagnau I, Perez-Diaz F, Chapouthier G. Differences in anxiety-related behavior and response to diazepam in BALB/cByJ and C57BL/6J strains of mice. Pharmacol Biochem Behav 2000; 67: 739-748. Araujo MC, Barcellos NM, Vieira PM, Gouveia TM, Guerra MO, Peters VM, et al. Acute and sub chronic toxicity study of aqueous extract from the leaves and branches of Campomanesia velutina (Cambess) O. Berg. J Ethnopharmacol 2017; 201: 17-25. Saglam E, Kayir H, Celik T, Uzbay T. Effects of escitalopram on ethanol withdrawal syndrome in rats. Prog Neuropsychopharmacol Biol Psychiatry 2006; 30(6): 1027-1032. Majchrowicz E. Induction of physical dependence upon ethanol and the associated behavioral changes in rats. Psychopharmacologia 1975; 43(3): 245-254. Uzbay IT, Akarsu ES, Kayaalp SO. Effects of bromocriptine and haloperidol on ethanol withdrawal syndrome in rats. Pharmacol Biochem Behav 1994; 49: 969-974. Manu G, Padmanabha ST, Chandrakantha T, Ravishankar M. Evaluation of antianxiety activity of ethanolic extract of leaves of Ocimum sanctum (tulsi) in albino mice. Natl J Physiol Pharm Pharmacol 2017; 7(8): 827830. Tabassum I, Siddiqui ZN, Rizvi SJ. Effects of Ocimum sanctum and Camellia sinensis on stress-induced anxiety and depression in male albino Rattus norvegicus. Indian J Pharmacol 2010; 42(5): 283-288. Gruchow HW, Sobocinski KA, Barboriak JJ, Scheller JG. Alcohol consumption, nutrient intake and relative body weight among US adults. Am J Clin Nutr 1985; 42(2): 289-295. Lieber CS. Relationships between nutrition, alcohol use, and liver disease. Alcohol Res Health 2003; 27(3): 220-231. Korsten MA. Alcoholism and pancreattitis: Does nutrition play a role? Alcohol Health Res World 1989; 13: 232-237. Rao PSS, Bell RL, Engleman EA, Sari Y. Targeting glutamate uptake to treat alcohol use disorders. Front Neurosci 2015; 9: 144. Aguirre HE, Rosas AH, Soto HM, Martinez AL, Moreno J, Gonzalez TME. Bioactivity-guided isolation of beta-sitosterol and some fatty acids as active compounds in the anxiolytic and sedative effects of Tilia americana var. mexicana. Planta Med 2007; 73(11): 1148-1155. Dhingra D, Chillar R, Gupta A. Antianxiety-like activity of gallic acid in unstressed and stressed mice: Possible involvement of nitriergic system. Neurochem Res 2012; 37(3): 487-494. Bhagwat V, Chowta MN, Shoeb A, Maskeri R, Venkatesh V, Rai A. Evaluation of anxiolytic activity of vanillin in wistar albino rats. Int J Nutr Pharmacol Neurol Dis 2013; 2(3): 96-101. Raines T, Jones P, Moe N, Duncan R, McCall S, Ceremuga TE. Investigation of the anxiolytic effects of luteolin, a lemon balm flavonoid in the male Sprague-Dawley rat. AANA J 2009; 77(1): 33-36.